He lost his mother as a cub and was sold by the hunter who killed her - and was destined to fall victim to the live animal trade until he was rescued by Vietnam's Forest Protection Department. He arrived whimpering, sad and lost. 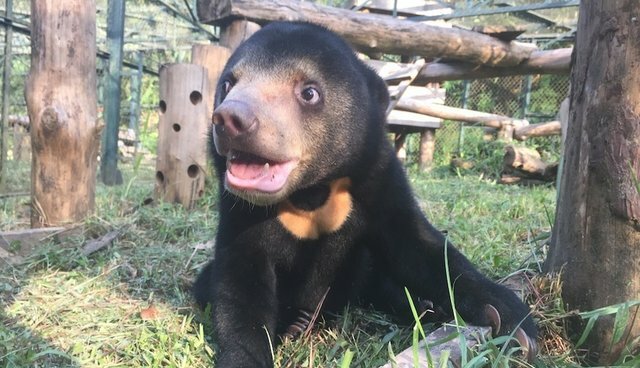 At six weeks old when he arrived, Murphy became the youngest bear at Animals Asia's Vietnam sanctuary - the youngest sun bear the team would ever raise. Now, after working with our bear workers and vet team for the past three months, Murphy is starting to become ready to face the world again. And what could be more exciting than to have his own personal playroom? That it's in the great outdoors is almost besides the point. The big draws for Murphy are the toys to play with, the structures to climb - and lots of space for twirls and tumbles. This is a very brave bear indeed. "It's been a privilege to watch Murphy grow up over these last few months. When he came to us, we couldn't believe he'd be able to get over the trauma of being taken from his mother at such an early age. It's a testament to this amazing sun bear that he's growing up to be such a happy boy - and a sad reminder of what his life might have been like if there was no bear trade. It's hard to describe how proud I am of the strides he's taken, every new toy he conquers, every rotten log he finds. Working with him to get to this point is one of the most rewarding tasks I've taken on at our sanctuary, and I can't believe how coordinated he's gotten. He's grown up so fast, and we're so happy he's loving the long and fun life he has ahead of him." Murphy is one of the lucky ones. 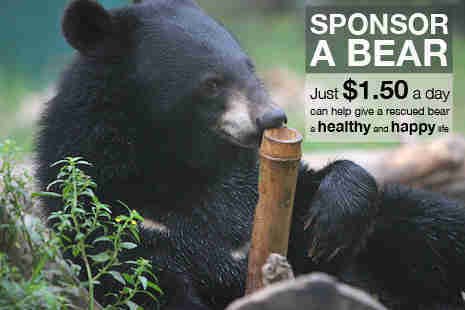 There are still over 1,200 bears in cages in Vietnam facing regular bile extractions for use in traditional medicine. In China that figure is over 10,000. Bears can spend up to 30 years like this. Thankfully - though Murphy has had a tough start to life - he'll be enjoying every sunny day from now on.